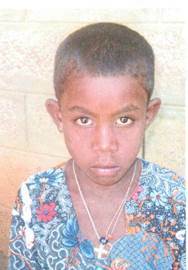 This is a photograph of Anguach Kostir, the little girl we sponsor through the World Vision Programme. She was born on 2nd January 2004, and lives with her 28 year old sister, Tezanu, in Yilmana Densa, Ethiopia. She is not yet enrolled at school, but education in one of the priorities of the sponsorship project. She loves to play when she has the chance, and her favourite pastime is playing with a skipping rope. Anguach has to help out at home where her special job is looking after the animals. We recently received a letter written by Anguach's project worker, in which Anguach's sister tells us about her life in Ethiopia. You don't need a Facebook account to view the photos – but if you do have one, feel free to add your comments and questions to the photos to let us know what you think. As part of an ongoing project the children are writing letters and preparing drawings to send to Anguach. These will be sent to her project worker who will translate the letters for her. We find out about Anguach and where she lives in Sunday school. We organise fundraising events to raise money to support Anguach. The congregation has a special fund which pays £18 per month to World Vision. In December 2012 we added the donations received at the 2 carol singing events to the World Vision fund. In the spring of 2013 we made and sold Pairs Games to raise money to support Anguach. 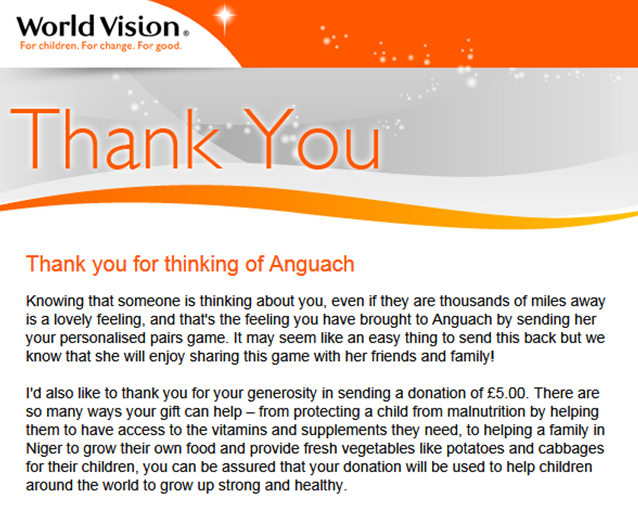 We sent a special version of the Game to her, along with a donation to World Vision to cover the cost of postage. This is the reply we received from World Vision on her behalf. Ethiopia is a beautiful and historic country in ‘the Horn’ of East Africa, bordering Eritrea to the north, Djibouti and Somalia to the east, Kenya to the south, and Sudan to the west. It is a mountainous country with a mixed population of Muslims and Eastern Orthodox Christians. 85% of its population are subsistence farmers growing cereals and pulses or keeping sheep, goats and cattle. Coffee is grown for export. Low world prices and recurrent droughts have contributed to Ethiopia remaining one of the poorest countries in the world, prone to famine and food shortages. Yilmana Densa is a rural area in northern Ethiopia, about 450 km from the capital, Addis Ababa. Most families rely on farming to survive and often struggle to survive in times of drought. 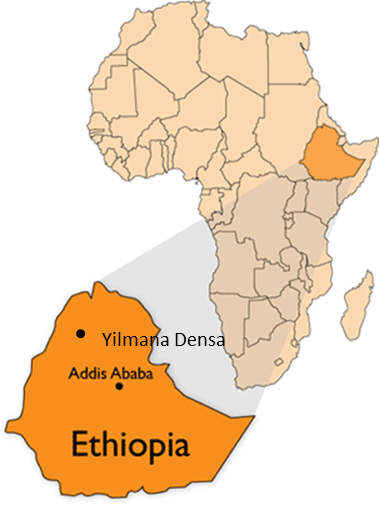 The World Vision Yilmana Densa Area Development programme started in 2003 and will serve up to 360,000 people. Project staff are working with the local community to plan activities for the next few years which will support them on their journey out of poverty. Access to education and healthcare have been identified as major challenges. New schools and expansion of the health centre are beginning to help with this. Other priorities are to provide a clean water supply and raise awareness of HIV/AIDS. Child sponsorship in Yilmana Densa is expected to end in 2020, when the community will continue their own development.